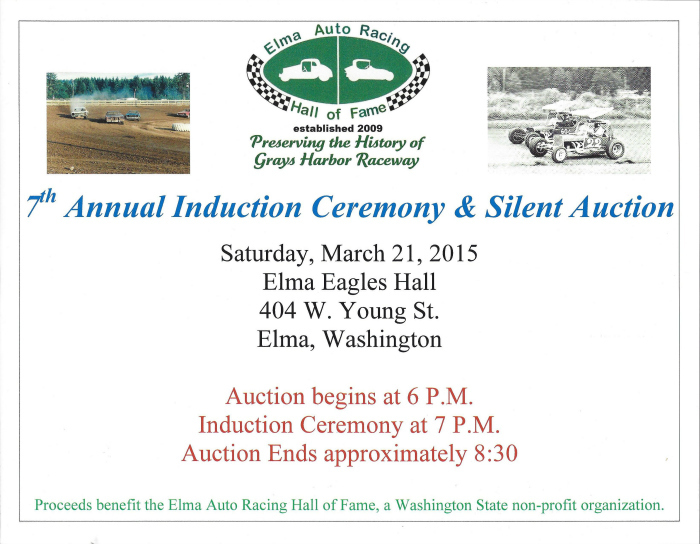 Elma, WA (February 7, 2015)…..Eight men covering 7 different decades of auto racing at Grays Harbor Raceway have been announced as the next group to be enshrined into the Elma Auto Racing Hall of Fame. The class of 2015 will officially enter the EARHoF at the7th Annual Induction Ceremony and Silent Auction on Saturday, March 21, 2015. The newest group contains track champions, longtime officials, crew members, track workers, and supporters who have made the racing experience special for the fans of Grays Harbor Raceway. Mike Zvono, a four time sprint car champion from 1985 – 1988, will join his father, Nick, as an EARHoF Inductee. Zvono, who is deceased, will be represented by his family at the official ceremony. John Dickinson began as crew member and partner on a jalopy in 1968, eventually becoming one of the top crew chiefs in the sprint car ranks. Dickinson also led the Evergreen Auto Racing Association as president during the 1990s. Now residing in Arizona, Dickinson plans to return for the Inductions. Charlie Gibbs, Jr. brought his semi-modified from his hometown of Sedro Woolley to the Elma ½ mile in the late 1960s and raced to the track championship in 1970. The deceased Gibbs, a top runner at many Northwest tracks in his driving days, will be represented by his family. Earl Fritts won the 1970 Jalopy Championship, moved on to be a top competitor in the semi-modifieds and eventually raced super-modifieds throughout the Northwest. A former instructor at West Point, Fritts hopes to return from Arizona for the activities. John VanWyck held many duties at the race track including race driver. The Aberdeen resident claimed the 1977 Hobby Stock Championship during his driving days and then became one of the most valuable track workers for many years as tow truck operator. Ken Courts days in racing date back to Central Parks Evergreen Speedway in the mid 1950s. Courts competed primarily in jalopies and hobby stocks, but could be found helping anyone who needed help in any class of car. Earle Sargent purchased his first race car for $50 and began racing at the Elma Fairgrounds in 1957. Sargent later became a crew member on cars owned by Perry Crowell and has remained a racing fanatic to this day missing very few races. Sargent will be inducted at the 2015 Larry Spoon Distinguished Service Award recipient. Glenn Vincent put his name in the record books as the 1997 Super Stock Champion, but his influence and legacy on racing at Grays Harbor Raceway continues today. Vincent had a big hand in getting the current modified class started and then the Modified Nationals that attract top racers to Elma each year and through his Shipwreck Beads continues to sponsor the class. Fans in the stands are very aware of his many fan friendly activities. Vincent will enter the EARHoF as the 2015 Fred Brownfield Exemplary Contribution Award recipient. The 7th Annual EARHoF Induction Ceremony and Silent Auction will be held March 21, 2015, in the banquet room of Elma Eagles Hall at 404 W. Young Street, Elma, WA. The silent auction will get underway at 6 P.M. with the Induction Ceremony starting at 7 P.M. The public is invited. Admission is free, but donations are accepted to help the non-profit, volunteer EARHoF continue its mission of preserving and honoring the racing heritage of Grays Harbor Raceway. Only one week remains before the Elma Auto Racing Hall of Fame honors 8 individuals with induction into the EARHoF. John Dickinson, Mike Zvono, Charlie Gibbs, Jr; Earl Fritts, Ken Courts, John VanWyck, Earle Sargent, and Glenn Vincent will be recognized and honored for achievements and contributions to auto racing at Grays Harbor Raceway. The 7th Annual EARHoF Induction Ceremony will be held on Saturday, March 21st, in the Elma Eagles Hall Banquet Room. The evenings activities begin with a silent auction and social hour at 6 P.M. The Induction Ceremony is set for 7 P.M.
Other activities during the evening will include a Dessert Auction, 50/50 Raffle, and a Season Kickoff Raffle in which 3 winners will have an opportunity to win Winter Heat tickets and t-shirts donated by Cocopah Speedway, or a barrel of fuel donated by Masco Petroleum, or a gas card. Memorabilia will be on display throughout the evening and stories always fly about racing past and future. Hors d’ oeuvres, cake, and coffee will be served. The Eagles Hall bar is available to Eagles members and their signed in quests. Inquire as you enter. The public is welcome. Admission is free to the Induction activities and memorabilia. Silent Auction numbers are a 5 dollar donation. Proceeds from the auctions, raffles, and donations benefit the non-profit, 100% volunteer Elma Auto Racing Hall of Fame in its mission to preserve and honor the heritage of auto racing at the Grays Harbor Fairgrounds.